In this week’s Corn Comments segment, Jim Woster encourages listeners to donate to Feeding South Dakota for a chance to win one of four great South Dakota Corn Showdown Series prizes. 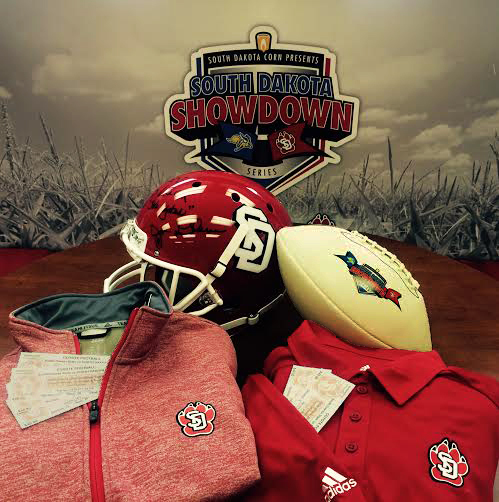 Grand prize includes a (SDSU or USD) helmet autographed by either USD head football coach Joe Glenn or SDSU head football coach John Stiegelmeier and four tickets to the Showdown Series football game between the Jacks and Yotes on November 14th in Vermillion. 2nd prize includes an autographed football from either USD head football coach Joe Glenn or SDSU head football coach John Stiegelmeier and two ticks to the Showdown Series football game. 3rd prize includes your choice of team sweatshirt (USD or SDSU). 4th prize includes your choice of team polo (USD or SDSU). 1. Simply visit Feeding South Dakota’s website. 2. Click on the “Donate Now” button. 4. Proceed to donate a minimum of $5 to Feeding South Dakota, and you will automatically be entered into a drawing to win. Remember that all donations go to Feedings South Dakota, the state’s number one hunger relief organization. The contest will run from October 26th until November 4th. This entry was posted in Corn Comments Podcast and tagged corn, Coyotes, farm, Feeding South Dakota, football, Jackrabbits, SDSU, Showdown Series, South Dakota, USD.